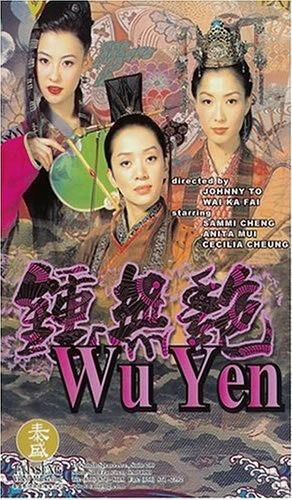 Wu Yen is a great movie. It is not a great film. If you are in the mood to read a movie, or you speak Cantonese (I assume it’s Cantonese), go rent Wu Yen. Right now. I’ll wait. It is difficult to describe what Wu Yen is like. I cannot think of one movie to compare it to. However, it is like a bizarre mix of Airplane!, Crouching Tiger Hidden Dragon, and La Cage aux Folles except that it’s more than that. A trio of Hong Kong starlets unite for a gender-bending farce co-directed by Johnnie To and Ka-Fai Wai (RUNNING ON KARMA, LOVE FOR ALL SEASONS). Based on a Chinese folktale, WU YEN stars pop singer-actress Anita Mui (aka “the Asian Madonna”) as Emperor Qi, the male ruler of an ancient kingdom overrun by warring tribes. Qi is set to marry the warrior-heroine Wu Yen (played by another pop singer-actress, Sammi Cheng [hey nonny nonny]) when a mischievous, bisexual sorceress known as Yin Chun (Cecilia Cheung) falls in love with both of them and begins meddling in their affairs. Yin Chun’s efforts include everything from disfiguring Wu Yen with a facial deformity to seducing the lovers in both male and female guises, resulting in a comic love triangle of fantastical proportions. Pretty much all the primary and secondary characters are played by the three stars of the movie giving it a somewhat Bizarro World/Shakespearian feel. There are a lot of extras on the DVD, including a very long behind the scenes view. Which was good because it helped me understand that these actors are real people who can be very normal in real life. I was afraid they had been to the Troy McClure School of Methodless Acting and as such were limited to strange facial expressions and overacting. As to my hey nonny nonny comment above… I need to start a Sammi Cheng blog/fan site. Especially since most of the sites I could find still have that 1996 look to them. She is on my list of women who, should they come to my door to whisk me away I will have to go with her. Sad, but true. On a Likert scale of 1-7, I give the movie a 6. I give Sammi an 8.